The nation of Biafra or Biafraland is beyond the areas occupied by the Igbo-speaking people of Biafra. For the avoidance of doubt, Biafra spans from Itsekiriland on the western boundary with Oduduwa to Bakassi on the eastern boundary with the Cameroons. Biafra also stretched from Idoma and Igala lands on the northern boundary with Arewa or Northern Nigeria to the Bight of Biafra which is south of the beautiful island of Bonny. In the present-day contraption called Nigeria, the nation of Biafra consists of the following states: Abia, Akwa Ibom, Anambra, Bayelsa, Cross River, Delta, Ebonyi, Enugu, Imo, and Rivers. Biafra also includes Igbanke in Edo state, Igala in Kogi state, and Idoma in Benue state. The footprints of Biafra listed above show that this great nation is not populated by only the Igbo-speaking people. It is also important to note that the last head of state and commander-in-chief of Biafra was not from the Igbo-speaking area of Biafralnd. During the war of genocide levied on Biafra by Nigeria and Britain, there were brave Biafran soldiers, field commanders, scientists, civil servants, technocrats, musicians/artists, and astute journalists/broadcasters who were not from Igbo-speaking areas of Biafraland. Biafra is a nation where different languages are spoken but irrespective of the varying languages, the people have a common value system, four market days, and a unique traditional clothing (two-piece wrapper) for every Biafran woman. It is instructive to note that Igbo is just one of the languages in Biafraland. 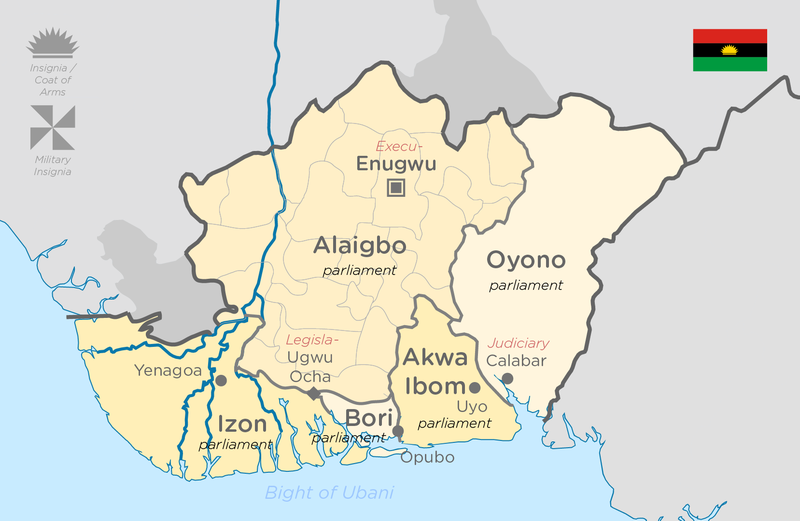 Even the Igbo language has different dialects as someone travels from one community to the other or from one state to another state. The Indigenous People of Biafra (IPOB) is using this press release to warn some people who speak or write out of ignorance on the history and geography of the nation of Biafra. Recently, some self-serving individuals and moribund groups have pigeon-holed Biafra into Igbo. They interchange and juxtapose Biafra and Igbo as if both are synonyms. The restoration of the nation of Biafra is not an exclusively Igbo cause but involves all the rest of the clans in Biafra. Therefore, it is misleading for any misguided relevance-seeking individual or group to seek to restrict Biafra to an Igbo affair through their mischievous newspaper interviews. We caution and advice newspaper proprietors and editors to obtain clarifications from the Directorate of State of IPOB headquartered in Vitoria-Spain before going to press because many desperate individuals are seeking to popularize their activities by using the hallowed name of IPOB and misinforming the public with lies and subterfuge. These individuals who are sponsored by the murderous Nigerian government of Retired Major General Muhammadu Buhari and acting out the script written by corrupt Igbo politicians should refrain from this unsavoury act. Biafra is not about the Igbos alone but Biafra is a blessed nation of people with common value system. The public must ignore and stay away from anyone or group that equates Biafra with Igbo. The Indigenous People of Biafra (IPOB) is not for only Igbo-speaking people and will never be for only Igbo-speaking people. Not all Biafrans are Igbos!!! Their divide and rule tactics/games can never hold water again.. the more than 90% oil blocs the Arewas are doing every thing possible to retain must get back to the rightful owners the BIAFRANS.. We know all their tricks..OLEES, KPARAWOOS!